There are 15 different gestures you can perform on your iPhone or iPad, not even including app-specific ones. AppleInsider maps out the obvious, the obscure, and the forgotten swipes of iOS, and shows you how to use them all. We're not really nostalgic for the original iPhone but it did have a certain simplicity. When Steve Jobs showed us how to swipe to unlock the phone, it was typical, startling Apple. No one else had thought of it and now Apple had, it seemed so obvious. Every other phone maker's combination of buttons to hold down was wrong. That one swipe changed everything and it became the focus of Apple's original iPhone ads, too. Only, if you now pick up a modern iPhone, that particular swipe is gone. And instead we have 15 different swiping gestures. They move you around between open apps, they give you fast access to information or the camera. They make using your iPhone speedy -- but not all of them are always available to you and some are duplicating or overlapping with each other. This is all iOS itself, too, we're not counting common gestures within apps like tugging down to reveal search bars. It's also not counting dragging or dropping and we're building up to telling you the iPad brings even more. You will know at least most of these and you'll know them so well that you have to stop to think how you do them. Yet there will be ones you've either not seen or not tried. And if you've ever had something happen on screen that you didn't expect, here's what gesture you made to cause it. Pick up your iPhone and even without unlocking it, you've got swipe gestures available to you. The regular swipe up to get to the home screen doesn't work until you've unlocked but you can swipe from the right edge of the phone to the left and you'll open the camera. It's the full Camera app, open instantly and with all its features available to you including the ability to see photos -- that you've just taken. To get to the rest of the Camera Roll you have to unlock the phone. Do the opposite, swipe from the left edge to the right on the lock screen and you call up Widgets. You also have full access to whatever information is shown in widgets you've already added to the this view. You can't add new widgets, rearrange or remove them without unlocking. You can tick a To Do task as done in the OmniFocus widget if you have that and every widget lets you choose to Show More or Show Less. Next, you can swipe down from the top right to get Control Center. Your phone is still locked but there you can adjust brightness, volume, open a Home app panel and many more things. Once you unlock the phone, you gain the ability to edit widgets, to see all your photos and everything else. You can still swipe left to right to bring up those widgets and you can still swipe down from the top right to get Control Center. You lose the ability to swipe from right to left to instantly bring up the Camera, however. Now if you swipe from that right edge you switch between home screen pages if you have more than one. If you use only a single screen of apps on your iPhone then we admire your self-discipline. However, it doesn't matter as swiping at the side of that one home screen won't do anything. There remains a similarly quick way to get the Camera, though, and it involves more gestures. It's hard to see why Apple chose to do this, but you can get quick Camera access through Notification Center. As well as the swipe down from the top right to get Control Center, you can now swipe down from the top left. It doesn't do anything at all until the phone is both unlocked and opened but when you are then at the home screen or in any app, this swipe brings up Notification Center. You know how it works. If you've had a notification and not dealt with it then it will be on this Notification Center screen. However, while in Notification Center, you can now also swipe from the right of the screen to the left to go into the Camera. Take a photo and then swipe up from the bottom to leave the Camera and go to the home screen, or swipe left to right to return to Notification Center. In Notification Center, you can also swipe from left to right to move into the Widgets view. And then swipe right to left to go back. You can also get to the Widgets from the home screen. Go to the very first screen of apps -- either by swiping or tapping on the first of the little dots at the foot of the screen -- and swipe again from right to left. This brings up the Widgets exactly as swiping from Notification Center does. Except now if you swipe back from Widgets, you go to the home screen, not Notification Center. The Widgets view, Notification Center and Control Center are like overlays on your iPhone. They sit atop everything else so you can see a sense to calling up one and swiping to the others. Yet within the Widgets view, a swipe right to left does different things depending on what you were doing before you opened it. Plus, you can call up Control Center from the home screen, from within any app and even from within Notification Center and the Widgets just by swiping down from top right. You can't go from Control Center to Widgets or Notification Center. It doesn't matter where you are when you open Control Center, you cannot swipe to go anywhere else. You can only swipe up to dismiss it or tap on a control to go into its associated app. Once you're using an app, you'll see a wide, thin bar at the very foot of the screen. It'll be black or white depending on the color of your app's screen, but it will always do the same thing. Tap and hold on it and you can then swipe left or right to move between open apps. Except that bar also appears the lock screen. You can't swipe it left or right, you can only swipe it up. It's part of the gesture that takes you to the home screen and then this bar vanishes until you're in an app. It's not the only gesture for moving between apps on the iPhone, though. You can obviously swipe up from the bottom to go back to the home screen and look for your app. However, if you do that same swipe in slow motion or you swipe part way and then wait, you instead go into the Application Switcher. In iOS 12, the Application Switcher shows you each open app as a card in a stack. Swiping left or right along these cards brings apps to the fore and you can then tap to go into the one you want. Or you can flick your finger up to force quit one. You can press on two cards at once and flick both up to force quit the pair of them. Incidentally, even here in the Application Switcher, you can swipe down from top right to get Control Center. You can't get Notification Center or Widgets. 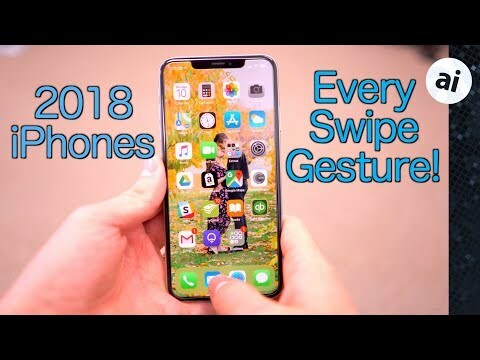 There is one more feature you can get on your iPhone using a gesture and for some reason you have a choice of two different swipes for it. The feature is Reachability, which was designed to help your thumbs get to the top icons on large iPhones. You know this and still you've never used Reachability. It always felt like a sop to people who were complaining about the bigger screens and Apple definitely made it a second-class citizen on iOS because you have to choose to enable it. Go to Settings, General, Accessibility and in the Interaction section there is Reachability. To make up for your having to schlep through all of that, though, Apple gives you these two different gestures to activate it. You can swipe down from very near the bottom of the display, which feels like tugging the screen toward you. Or you can quickly swipe up and down at the bottom of the display. In either case, iOS 12 slides the entire screen down so that your thumb can stop all that swiping at the bottom and just tap on the icon you need. And in both cases, these are the most fiddly gestures to get right. Doubtlessly you get used to them, but it's quicker to ignore Reachability and just, well, reach. We make that 15 different swiping gestures that you can do on this small piece of glass. If you have a larger one, though, then there's more. The iPad adds three more gestures and takes away one. That's a total of 17 different swipes you can make on an iPad and again, there are duplications and confusions. The one that's gone is the bar at the bottom of all your apps that you can drag to change between them. However, you do instead get the option of a five-finger shove. Place all five fingers on the glass and then swipe to left or right. You'll move between open apps. If we find Reachability a chore, this shove is our favorite: it is particularly fast when you're jumping back and forth between two apps. However if, instead of shoving left or right, you place those five fingers and very briefly swipe upwards, you go out of the app and back to the home screen. Do exactly the same thing but take a little longer over it and you go into the Application Switcher. This is the same Application Switcher that you get to on iPad or iPhone by swiping one finger up from the very bottom of the screen. Rather than cards in a stack, the iPad shows your open apps in a grid but you can still swipe left or right to move through many of them. And you can again swipe up on any one or two to force quit them. You might be more nimble-fingered than us and force quit three or four together. When the Application Switcher is open, you can also swipe on an app to bring it up but that starts to get into drag and drop which is another can of gesture worms. Depending on the size of screen you have, you get at least 15 and maybe as many as 17 different possible gestures. They overlap, some are subtly different on iPhone and iPad, and they're also inconsistent. Rather than seeing Widgets, Notification Center and Control Center as one layer atop the regular iOS home screen or apps, though, think of it as a series of layers. The home screen or apps are the first, then atop those you have Widgets and Notification Center. And then above those you have Control Center which you can get to no matter what you've been doing. It's just that even as we think of it all like that and it explains why you can always get Control Center, we've got that oddity of the Camera next to Notification Center. There's no question but that gestures are great: they become muscle memory and you fly around your device all the faster because of them. Still, think of all this the next time you tell someone that iPhones are obvious and easy to use. I went to an Apple Store recently and tried the newer’no Home button’ models. I found the lack of that button incredibly frustrating for navigation and I literally broke out in a sweat when I couldn’t figure out how to get out of an app. Conclusion: Sorry, but I do not like the new iPhones and there’s no way I’m buying a new iPad Pro now due to the same hobbling of the user experience. Conclusion: Sorry, but I do not like the new iPhones. It does take like a day or so to get used to having no home button, but you get used to it. And when you get used to it, it seems odd to use a home button (if you have to use an older phone or show someone with an older phone). For iPads, four fingers does the same as five. Five finger collapse or squeeze will go to home, which with four fingers is quite hard to do with one hand. Don’t think of them as discrete gestures, or it’s not like a swiping in a specific swiping motion like you are pressing a meta key combo. It’s reactive. When the iPad senses four or five fingers on the glass, it goes into the app switching UI mode, which is reactive and can switch apps, go home, go to the previous app. You can go as slow or fast as you want, one it recognizes that you’ve put four fingers down or swiped up from the bottom with one. You can see that the iPad is going home as you swipe up, and as long as you don’t lift your fingers, you can change it to going to the previous app or go to the expose like mode. Took me about a half an hour. The only problem I have (still) is that when I press and hold an icon so I can delete something, I got used to pressing the home button to cancel the edit mode. Now there is a small done button in the top right corner of the screen. Because I move and delete apps so infrequently, this has taken me longer to get used to. The rest of it though, not really a problem. I found the lack of that button incredibly frustrating for navigation and I literally broke out in a sweat when I couldn’t figure out how to get out of an app. It will take you less than an hour to get used to not having a home button. Millions upon millions of us have done it and it is far better without the home button. Just have to replace the old muscle memory with a new one. He has one but he can’t get to it! I still have a 6s with the good ol’ home button but I’m probalby going to get an Xr in the next couple of months. My first iphone was a 3G, so we’ll see how long it takes me to get use to it. One group of users that will likely have trouble is older people. I got my parents iPhones simply because they were infinitely easier to use than the flip phones they had. The single button made it easy for my mother to operate and always gave her a way to get back to the home screen that she recognized. Swiping up isn’t that difficult, but for someone who doesn’t deal well with technology, a button is far better. All people need to do is swipe up with one finger from the bottom. That gets the user to the home screen, the same function as a single press of the home button. Like I said earlier, it’s not a discrete gestural input like writing a letter a something. It’s reactive. You can change what you want to do mid-movement. Eg, you can swipe up, slide the least use app to the right halfway, look at whatever (like a calculator result) while not lifting your finger, and swipe back down to get back to the app you started with. This type of stuff builds upon itself, so as a user get more proficient, the UI can grow with them. But for just basics, a swipe up gets a user home. The home button was overloaded with single click, double click, long press, and triple click even. The capability of users who used the home button to its fullest wasn’t all the big, and most people just used a single click. And nobody should be using 5 fingers on an iPad, when 4 fingers is easier. You can use one finger as long as you start from the bottom. Is there a shortcut to jump from say your 6th screen back to 1st? With Pre X phones one click on home button would do it as you know. It just takes 10 minutes to get used to it Spam. In 30 minutes, you'll find yourself swiping up on your older devices with the Home Button. You’ve made over 30,000 comments on this site, but you expect us to believe you never watched one single review of an iPhone X, XS/XR or new iPad Pro? I knew how to do it all just from watching Apple’s Keynote when the X was revealed last year, and it took me a whole 5 minutes to figure out most of it on my own on release day when I got the X. After having the X for a couple days, picking up my 2017 iPad Pro 12.9” felt archaic and cumbersome. I truly started to hate it. I simply LOVE my 2018 iPad Pro 12.9” because of the lack of the home button. A quick swipe to the left once in the app switcher will usually do it. Actually, if you go into the app switcher, and go to an app 6 deep, it now becomes the first one. One swipe to the right will put you back to what was the first app before opening the 6th. It’s very intuitive. >>>A quick swipe to the left once in the app switcher will usually do it. Strange, not doing it for me. On your other Comment/hint( app 6 deep) it's not the app position that's the issue. I want to jump to first screen via a shortcut when I'm 6- 8 screens from home. You are talking while in the home screen, you are 6 home screen pages to the right, and you want to jump to the 1st page? I don’t think there is a one tap or one grab and slide action for that. You can just tap on the left of the home screen page indicator (the small dots above the dock) and it’ll go to the page on the left, and vice versa on the right. So, 6 quick taps get you there. Apple could make those dots individually selectable, but that quickly becomes overloaded for people who have 10, 20 home screens (unless there is a limit). Yes, you got it. So no feature on an X model that was on the earlier models by use of home button. If Apple moved up the dots a bit and enabled swiping through the dots to get back to screen one I'd be a happy camper. Thanks for the follow up. Don't get me started on Apple still only having 2 alarms for calenders events. Glad I have Fantastical!! If you’re on the last page of apps, say... 6-8 pages deep, a quick swipe up will jump you back to the main home screen. It’s the same idea as hitting the home button again. If you’re in an app, a swipe up takes you home. Another swipe up will take you back to the first page on the home screen. Oh, btw... I just figured this out as soon as I realized what you were referring to. I’ll be using that gesture from now on. I thought you were referring to open apps in the switcher. As far as calander alarms, many people don’t need a plethora of notification options. Fantastical exists to give users more control. That’s why Apple does allow some apps that duplicate stock app features, as they can give granular control. @Aqboy4ever swipe up will get you back to your home screen, same as clicking on the home button used to do.